It was a beautiful Tuesday morning during a week of vacation. The weatherman said it was going to be sunny, high 70’s, low humidity, and breezy; more on that “breezy” statement later. How should a fellow spend such a nice day? Why, get lost on his new motorcycle, an ‘07 Suzuki VStrom 650. Just a few days old and so far I’d only logged 145 miles. Well, that would change by the end of the day. I had three goals for the day. 1- Get a new ball cap at Buzzard Billy’s Flying Carp Café in La Crosse, WI. 2- See the Mindoro Cut. 3- Stand at the farthest southeastern point, on a public roadway, in Minnesota. My route began at the St. Croix River in Lakeland, MN. Washington County Road 18 brings you through this small town, linking up with C.R. 21 at Afton, MN. C.R. 21 is one of the best stretches of motorcycling road in the Twin Cities area, as it winds and climbs and drops until reaching US Hwy 10. At Hwy 10, I crossed the river into Wisconsin at Prescott to head south on WI Hwy 35. And now the fun really begins! Before crossing the river, I stopped at the beachfront park to snap a few of the day’s many photos. As I was heading back toward the road, a long line of motorcycle headlights were coming in my direction. “Oh, no!” I thought. I’m going to have to compete for this grand road with a long line of Harleys. But they weren’t Harleys; all were the new Victory “Vision”. There must have been about 40 of them, all with dealer plates. Corporate function, eh? I waved as they went by, and then fell into line behind them to cross the river. Luckily for me, they decided to turn left on US Hwy 10 east, while I turned right to follow WI 35 south. As I had mentioned, it was supposed to be a breezy day. Breezy was an understatement. It was darn windy. The west wind wasn’t so noticeable riding out of town, but once I was rolling down the river, the wind was showing its teeth. More than once I found myself leaning into the wind, looking like I should be riding through a cloverleaf ramp. The wind howled constantly until later that evening. Riding WI Hwy 35 south from Prescott is a great experience. River views, forests, farm fields, hills, valleys, stone bluffs, gentle twists and turns. I rolled alongside freight trains and river barges, while birds of prey flew overhead in search of a meal. I haven’t confirmed my suspicion, but I think the highway engineers designed the south half of WI 35 just for motorcyclists. I was at a historical marker on WI 35 just south of US Hwy 63, reading the interpretive sign and gulping some water, when what did I see, but the long line of Victorys hauling down the highway. We exchanged waves as they cruised by. This is what it’s going to be; cat and mouse. After a few minutes, I mounted up and hit the road. The Victorys were long gone. There was a wayside rest a few miles down the highway. Well, well, it’s my turn to overtake all those Big V’s with my Little V. There they were, lined up like in the dealer showroom. More waves were exchanged, and I was sure more than a few of the Victory riders realized the cat and mouse game we were having. The little river towns came and went. I wish I had more time to stop and visit, but this creates another opportunity to re-visit the area. But I did stop atop Lake Pepin, at the Lake Pepin interpretive signpost. After some photos, I sat down on a big rock and just gazed out over the vast river valley which forms the lake, feeling life’s petty little worries blow away in the wind. This is why I ride a motorcycle, to discover and experience places like this. But I’ll let you ride there to read the sign for yourself to discover how Mother Nature created the lake. Back on the road, I saw the train of Big V’s coming from behind, and gaining fast. Remember, I was on a new bike that I paid for, not one that someone else paid for, so I’m not going crazy during my break-in period. And I’m a Minnesotan riding in Wisconsin, with no desire to have a talk with Officer Friendly. That line of bikes caught up to me, but paced behind. After a minute, I looked down at my speedometer and decided that the cats had caught the mouse. 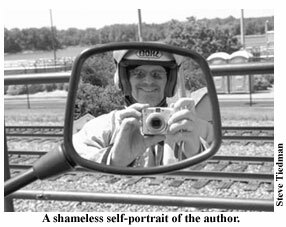 The road was wide and clean and smooth, so being a gentleman, I stuck to the shoulder, eased the throttle down, and waved them by, getting 30 or 40 waves in return. I fell in behind them, and a short while later they branched off at a river crossing back to Minnesota. I was still heading south— I needed a new ball cap. I arrived in La Crosse and immediately got lost. I didn’t have a town map; all I remembered from my previous visit of a couple years ago was that my destination is in the historic downtown, near the convention center. Buzzard Billy’s Flying Carp Café is a terrific bar/restaurant with a menu sure to please your taste buds with their Cajun-Creole offerings— great blackened catfish! When I was last at Buzzard Billy’s I bought a really neat ball cap, but time had taken its toll, and I was hoped to replace it. Sadly, they were out of caps, so I came home with a cool tee shirt instead. The next time you are in La Crosse, stop in for a delicious meal (and let me know if they have any caps yet). And if you have time, wander around the downtown area where history abounds. La Crosse is a great place to spend a weekend. Earlier in the day, I somehow “misplaced” my printed copy of this website map, and I was sure glad I did that. The “lost” route I took led me north on US Hwy 53 to Holman, WI, exiting east on C.R. HD to C.R. D, east to Hwy 108 at Mindoro. These are wonderful roads through farmed valleys overlooked by tree-lined bluffs. I headed south on Hwy 108 a few miles until I found the Mindoro Cut. 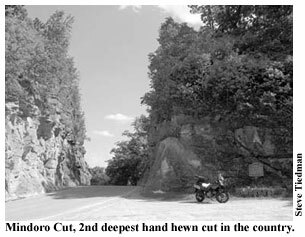 It was impossible to miss; the Cut is a 74-foot deep, hand hewn clearing through the stone bluff, with stone walls on each side of the narrow road, and an interpretive sign on the north side of the Cut. This stretch of road is not one to get crazy on, so watch your speed, watch the tight curves, and watch for law enforcement. Hwy 108 is just one example of the terrific riding that is found in this area of Wisconsin known as the Coulee Region. Leaving the Mindoro Cut, I tracked back toward La Crosse, but I was concerned all of my side trips and picture taking had encroached on my desire to be back in the Twin Cities before dark. My last goal for the day was to get to the farthest southeastern point of Minnesota on a public road. That would be the south end of MN Hwy 26 where it meets New Albion, Iowa. Why? Well, because it’s there. Eventually I want to do the same at all four corners of the state. I decided since I was 30 miles from the Iowa border when I entered La Crescent, Minnesota on I-90, I would take the chance and make a run for it. It was now 4:00pm; I had one hour to get to Iowa and back so I could make the Twin Cities before nightfall. Highway 26 was just another beautiful stretch of road, making me wish I’d planned this to be a multi-day trip instead of a single day. But there is always next time. I made it back to I-90 at about 5:00pm. If I would have had more daylight ahead of me, I would have continued north on US Hwy 61, following the river back to the Twin Cities. I enjoy riding at night, but I didn’t feel like gambling with evening time critters coming out of the woods. Instead, I opted to take the freeways; I-90 west into Rochester, then US Hwy 52 north to St. Paul. The wind I’d been battling all day was making its last stand during the trip to Rochester. The gusting headwinds made it feel like I was riding in the triple digits. But my new bike handled it like a champ. We got tossed around a bit, but my VStrom accepted the challenge without complaint. Finally, the wind started to ease on the northbound trip up Hwy 52, and around 8:00pm I crossed over I-494 in Inver Grove Heights. By the time I got home, I had logged 460 miles in a bit under 13 hours; my longest single day ever, both in miles and saddle time. Not a bad way to spend a vacation day, getting lost in the river valleys of southeast Minnesota and southwest Wisconsin. Leave your GPS at home and go discover what Mother Nature has provided us.